Women’s rights advocate Gloria Feldt says the current wave in history with #metoo and #timesup didn’t just happen. “It takes people coactively and intentionally having a vision, having the courage to take action, then having the persistence to stay with it until it’s done,” she said. That’s a key idea in this interview with Dr. Nancy because: first, Dr. Nancy and Gloria partner together through Take the Lead and WomenConnect4Good, working on behalf of women; second, Gloria persists to train, inspire and propel women into equal parity through co-founding Take the Lead; third, they are launching a historical event together to benefit Take the Lead featuring Gloria Steinem’s personal appearance at a biographical play in New York City. Gloria Feldt said she is certain this will be a life-changing event for anyone who attends the play. She urged people to donate to give a scholarship for another woman if they can’t go themselves. Their goal is to get 100 young women there to receive the inspiration to become future leaders. As one of the most famous faces of feminism, Gloria Steinem will be there to lead the discussion about the social justice movements that have occupied most of her life. To understand where we are, it’s important to understand where we’ve been, with many feet making progress, opening doors and working together to make history. 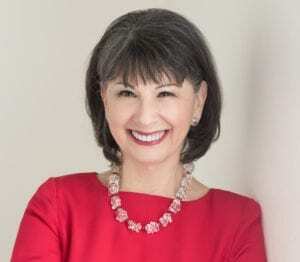 When researching her best-selling book, No Excuses: Nine Ways Women Can Change How We Think About Power, Gloria Feldt said that she read research saying that there were fewer women leaders because they were less ambitious than men. She knew in her heart that wasn’t true and started her own research into how women felt about power. Culturally, women are taught to shun power because they’ve been abused, harassed or otherwise been victimized. But when women saw power as the freedom to innovate, create and make life better for their families, or their world, Gloria said, the women she interviewed would relax and welcome that idea of power. In fact, she said, it’s miraculous what happens when women embrace their power and set their intention to become what they are capable of being. Through Take the Lead’s mission—to prepare, develop, inspire and propel women to take their fair and equal share of leadership positions across every sector by 2025—Gloria has extended her “9 Power Tools Training” and aimed it at creating cohorts in different industries that need women leaders. So far, 50 Women has completed one session in non-profits (AKA the social profit industry), one in media and entertainment, and is about to conduct one in finance and one in health care. Future programs are planned for technology and in different regions of the country. Gloria said that once a cohort spends few weeks working together, they nurture, support and network with one another to form bonds that extend far beyond the 50 Women program. The Gloria Steinem special matinee presentation will benefit 50 Women Can Change the World Programs, providing scholarships for promising women who could become tomorrow’s outstanding leaders and truly change the world for their industry. The play is scheduled for 2:00 pm, on Saturday, December 15, 2018. There are different benefit levels. Beyond the basic admission, there is a VIP reception with the producer, Tony Award winner, Darrell Roth, and a few select donors can attend the dinner afterwards. If you have further questions, Gloria urged people to e-mail her at gloriafeldt@taketheleadwomen.com. Listen to this interview to find out more about everything—The Gloria Steinem Event, Gloria Feldt’s amazing story, and Dr. Nancy’s and Gloria’s optimistic predictions for women in the future. Check out Gloria’s website for more about Take the Lead, upcoming programs: 50 Women, Virtual Happy Hours, mentoring, coaching or other training programs. 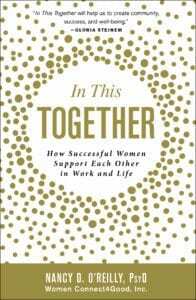 Gloria’s ideas also appear in Dr. Nancy’s new book, In This Together: How Successful Women Support Each Other In Work and Life, along with thoughts, advice, and stories from 40 successful women across a variety of careers—from authors to actresses, CEOs and professors—encouraging women to support each other in the workplace and in life. Ready to learn about action plans on how all women can work together to break free from the binds of gender inequality? Then remember to order your copy – and gifts for your friends.